The Mermaid's Tale: The mouse that roared, or the lion that peeped? 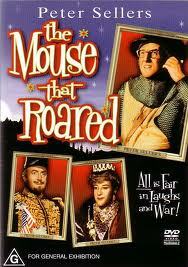 The Mouse that Roared was a funny comedy film, decades ago, about a little Alpine principality (the Duchy of Grand Fenwick) that managed to bring the US to its knees, to win major concessions. The idea was to declare war on us, to lose, and then be the beneficiary of all the largesse we dump on those we defeat. In science as in other areas of human endeavor, especially in a society slavishly obsessed with the 'business model' and 'competitiveness' and the bottom line--even in universities, we want to get the most bang for the buck as this little mouse of a country did by roaring at the huge US. Science as it is practiced today raises some relevant issues. The other day we criticized a very big study about calcium intake and heart disease risk, and it was but one of many critiques we have made again and again (and again) here on MT. Our point was that sloppy designs and non-definitive results, that have to be repeated again and again (and again) with ever larger scales and for ever larger budgets, are becoming more of the rule than the exception. In our areas of (we hope) knowledge, we blog away at the practice of ever increased scale for ever diminished payoff. Examples are massive GWAS to find hundreds of miniscule, ephemeral possibly-causal genetic effects. Despite fervent denials and claims of success, that's what's afoot in biomedical and other sciences. It's the way we build careers, maintain labs and reputations, and earn our nice academic salaries. But that is not the same as roaring lions of discovery. Real progress. We need ever larger, ever repeated studies because what we're trying to find are unclear, non-definitive, or (generally) minor effects. It is more like fiscal lions generating peeps of results (but then roaring about them as if they were lions). This kind of hyperbole is in the science news every day. Indeed, the fact that there is a science news is part of the story, because the news outlets need to sell and the news needs stories, and investigators need the publicity to get their grants and make their careers, so we have a positive-feedback system where the big begets bigger, and the brag begets bragger. We have come to something ColdWar-like: Mutually Assured Dependence. As in the other day's post's example, larger and larger studies are needed if the effects we want to find are smaller and smaller. And that also generally means that they are part of complex interactions in multi-factorial causal systems. A small cause's effect depends on the other causes present or not present. Even a cause that's always present, but is small, requires large studies to detect. By contrast, truly major causes can be detected, replicably and reliably by small studies, that don't cost that much money and don't have to be endlessly repeated. They are the mice that roar. The late curmudgeonly David Horrobin said something to the effect that if you can't find it in samples of 30, it's not worth finding. That's an exaggeration....but how much of one? But our culture today is about spawning nearly mute lions. We harp on this because lots of your money is paying for this kind of research. Instead, we should be able to provide smaller funding to more people, hoping somebody will make lucky or insightful discoveries, or being less socialistic, we could really pour funds at problems that really are genetic or more clearly addressable with accountable impact in the case of public health or evolutionary science. Maybe truly genetic diseases could be prevented or cured more effectively and more quickly if we did that. Nothing's perfect. First, pouring money into what should be soluble problems could be like the War on Cancer and other government allotments: There may only be so many good researchers, and they may already be funded, for these problems. And, as is manifestly clear, anytime there is a pot of dough, the hogs rush frantically to the trough so one would have to have strong constraints so the funds don't get divided up among a crowd of claimants generating chaff. In fact, this is how the system largely works now, with me-too being a major modus operandi. And, ironically, those who would rail against socializing funding (equalizing distribution, etc.) may not realize that to a great extent that is what our system currently does. It's how all the med schools keep their research factories in operation 24/7--by investigators flocking to wherever the funds are, inventing whatever rationales for their own ideas that we can think of. In a way, because it is also intensely competitive, it is a form of capitalistic socialism, a strange beast! Instead, we build empires of hoarse lions, omitting the potentially much more cost-effective mice who, like humble miners' canaries, could lead us out of the most troubling problems we face.